What is an oxford shirt? - The explanation is provided here. What is an oxford shirt? An oxford shirt has an oxford weave. So an oxford cotton shirt is made of cotton in an oxford weave. Oxford isn’t a type of material or fabric, it’s a way of weaving the fabric. 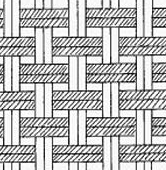 A common style for an oxford weave is two over and then two under, with the threads being woven in pairs, as shown in the image below. Technically, this should be referred to as a Royal Oxford Weave (called an Imperial Oxford weave by Charles Tyrwhitt) as it has two horizontal (weft) threads and two vertical (warp) threads. A standard Oxford will have only one vertical (warp) thread. I find that Oxford shirts are warmer than poplin shirts, but not as warm as twill shirts, so sit in the middle. Not too hot and not to too cold. You could call it a Goldilocks weave for spring and autumn. 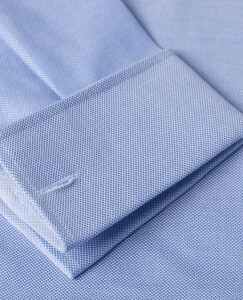 The weave of the shirt also tends to give them a lustrous sheen, as shown in the picture below. What is an Oxford shirt with a pinpoint weave? A pinpoint Oxford weave uses the same pattern but finer yarns. What is an OCBD shirt? An OCBD shirt is an Oxford Cloth Button Down shirt. So this is a shirt made using the Oxford weave with button down collars. If you want to know more about poplin weave shirt read what is poplin? To understand more about twill weave shirts read what is a twill shirt?